I was reminded of beeswax candles in egg shells by Over the Crescent Moon. I haven't made these without help before, so this was new. The process was much more simple than I remembered... but there were quite a few tricks to it that I learned today. Blow out eggs. Wash them out with water, and allow them to dry for at least 24 hours in the sun to prevent any bacteria from staying in side the shell. Use a double boiler to melt the beeswax. 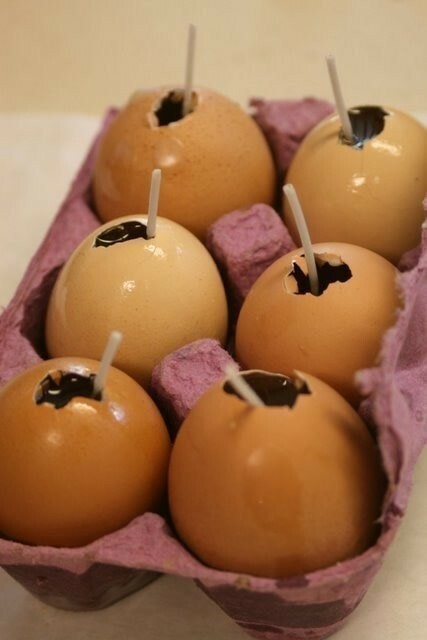 Carefully place a wick in each egg. It doesn't really matter if they stay up strait. The wax helps with that once it is in the egg shell. Once the beeswax is melted, using something you can throw away (in our case, cardstock and tape) make a funnel. 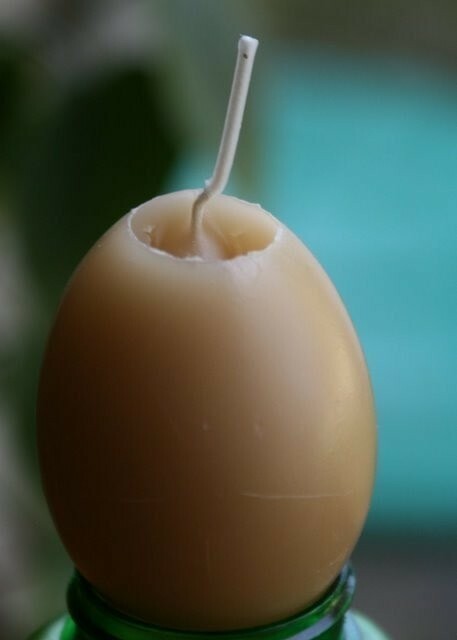 Put the funnel in the egg shell next to the wick and pour a VERY small amount of wax in the bottom of the egg to close up the hole. 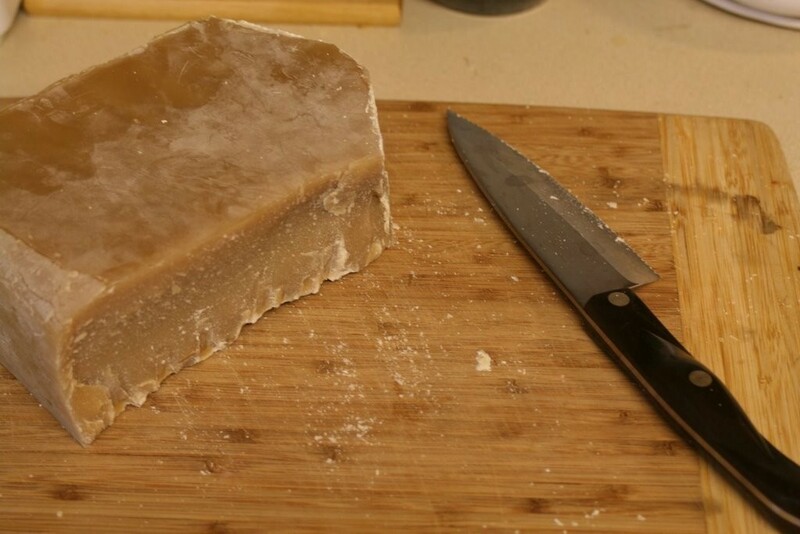 Let that cool for at least an hour so it is good and hard before you pour the rest of the wax in (we did a botany lesson and then came back to it). Fill the eggs carefully with the melted wax and move the wick to the spot you think would work best. Use the hole in the egg as a guide if you need to. The wick should have a bit of wax on it by this time to help it stick. Allow to cool naturally. If you put them in the fridge, they will crack (ask me how I know). When you are done, you should be able to peel the egg shell away rather easily, and you have an egg shapped beezwax candle! Now I know what to do with all the eggshells I set aside to decoupage but didn't feel like it anymore. 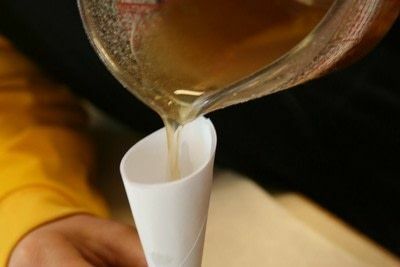 I even have the beeswax and wicking for this project. Thanks! I microwave my containers and measuring cups then just wipe the wax out with a paper towel. Of course this also works for candle holders as long as there's no metal in it. If there is I just put them in a bowl of hot water then wipe them out. I love this project and am planning on making some for Xmas gifts. I think I'll start with chicken eggs and then try osteridge eggs since there is a farm that sells them not too far from me. Super cute, thanks! This project is SO fantastic! Could you clarify what you mean by blowing out the eggs? i assume you mean to poke a hole and let the egg fall out but I'd like to be sure. This is sooooo great.. how freakin clever. 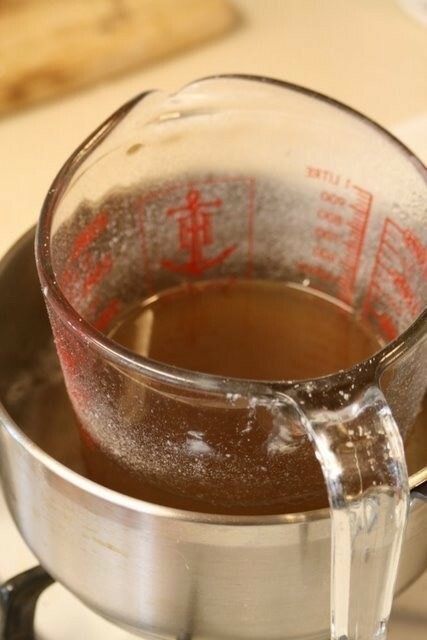 BTW: I use this trick when I'm cleaning out old candle jars so it should work for your measuring cup. Put it in the freezer. yup! really when its good and frozen it just all falls out. Hope that works. I would guess that if you wanted to make colored candles you could add some of the colored wax from the craft stores... like Jo Anns or Micheals. They both have the colored wax in their candle sections. Good luck! thats really neat =3. how could you add color to this? My mom would love this since we had pet chickens at one point! 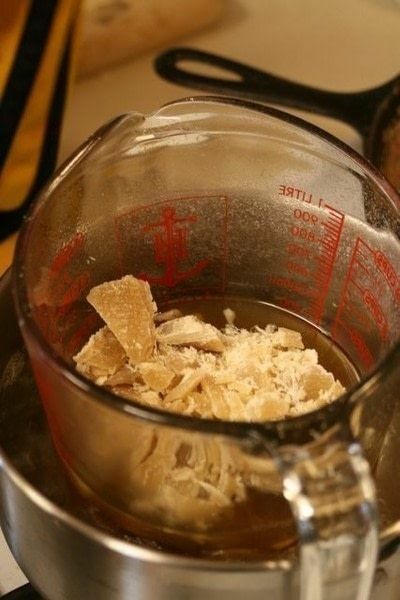 A tip for getting the wax out of containers. I scrape as much as I can while still warm. Then put it in a pot of boiling water. Turn off burner, and let it sit for a few minutes. Most of the wax should be gone. You can then clean the glass container with a little non-acetone nail polish remover. Then wash with soapy water.